Hello~ minnasan~! !Another update from me yet again. Sorry for those who were expecting releases from us, hahaha. And for saying I would release something on Christmas day, pfft. I bet MXR was the only group that couldn’t release anything for that special holiday. It’s a bit disappointing on our part because it was the first time we missed it. We can’t help it though, everyone’s away. Anyway, this is an important update or rather “plans” for MXR in 2014 onward. Please read them carefully. MXR is going to stop scanlating manga after all of our current and on-hold projects are up and done with. That includes future projects with the other groups, like Mobile Sweet Honey with Mnight Haven. I know these manga I bought were supposed to be only for MXR only and I really appreciate for everyone’s contribution for them all. But after what happened within this year, I have realized how exhausting and troublesome scanlating manga can be. From all these troublemakers and these nuisance of a publishing company policies (coughLcough) to other groups who are working on the same damn title, it’s really getting on my nerves. With our current condition of being understaffed however, we may not be able to finish everything all in one go but we will cease taking up new manga projects then. I’ll make an exception for the new ones I have purchased, though – Hana to Usagi, Kuro Wanko to Kin Kitsune and Kamatte Hoshi no? The rest will be up for adoption if other scanlation groups wants it. I’ll post a different post for that later. Mangas up for adoption here. Due to the staff being away, went MIA without my knowledge and have quit because of real life matters, MXR is once again recruiting for Japanese-to-English Translators, Japanese / English Proofreaders, Cleaners and Typestters. For those who are interested, you can take our tests here and just send us an email. We usually accept those who apply most of the time anyway. On the side note, let’s talk about non-scanlation stuff! I got a new hard disk drive and I lost a year worth of bookmarks of Chinese scanlations from Tiebaidu so this is gonna be hard for me if I start collecting them again. Fortunately for me, I have a few, especially that Sheep!Tsuna series saved in my folders :P If anyone would like to help me with providing us Chinese scanlations for some available scans I have, send me an email/message! 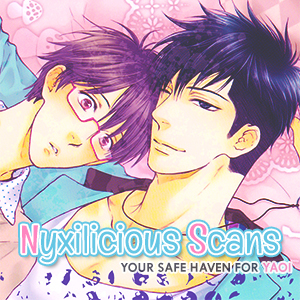 For list of doujinshi covers, check my blog, yeah? Lastly, I hope we’ll have another fun year all over again =w= Haha. Mm, and that’s all for now! My brain is now fried. Ugh. MERRY CHRISTMAS and HAPPY NEW YEAR to all, yeah?? See you guys next update!